Musings Over a Barrel: Beer, Good. Frosted Glass, Bad. 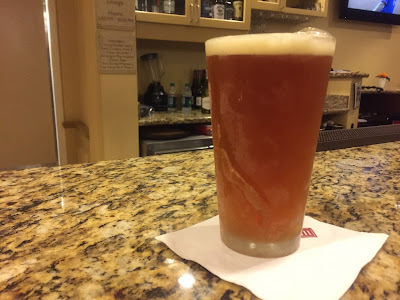 As I walked by the hotel lobby bar during a visit to Blacksburg this week I spied three tap handles; Hardywood Park Singel, Devils Backbone Vienna Lager and Foothills Hoppyum IPA. That was the entire draft lineup. "This will be good," I thought. I knew how I'd relax at the end of the day. Late in the evening, as Colleen and I sat down for a late beer and snack, I noticed a Budweiser tap had been added but still, three out of four isn't bad. I was impressed. Then as our beers were set in front of us, we just looked at each other and shook our heads. Frosted glassware! Not just cool, but I can't even hold the glass iciness. With such a fine selection, it was surprising to see how the beers were served. Obviously somebody is placing good beer in the lineup, but missed the memo about serving them. Buyer, brewers, distributor, somebody should care. Anyway, once the ice melted, the glasses dried, and the lake that had formed on the bar mopped up, the beers were quite enjoyable. I think they are getting the idea that something other than Bud needs to be served. But they don't understand that icy glasses are because of beers that have no real taste - they depend on icyness for the pleasure because they have nothing else to offer. Oh, and check this out: http://www.wral.com/raleigh-beer-garden-and-its-366-taps-now-open/14785814/. My favorite "Gawddammit" moment is when the piece of ice, about the size and weight of a silver dollar, falls out of the bottom of a mug and lands on my lap - normally when I am wearing light colored trousers of course. I hear you! I've had that happen more than once myself. I also don't like it when my sandwich gets soggy from the ice water dripping off the glass as I drink. 'Ain't no Brit here, I like "COLD BEER!!" Tastes Fine!! Frozen mugs, way to Go!! 'Got a freezer full of em'!! Beer, from Bud Light to Becks, San Miguel to Shiner, Dixie to Dortmunder and everything in between!! I can do without the Titanic size Icebergs in my beer but I do love a good "Frost job"on a mug!! Oh yes, when I used to live in O.B. (Ocean Beach) that beat up Beach Community on the other side of Point Loma from Sandyeggo at a couple of the local bars they served "Red Beers!!" Pour about a half a shotglass or a bit more of Bloody mary mix in the bottom of your Beer Mug and add Beer!!! (Not too hot with Guinness though!!) 'Love em' especially with sea food!! Anyway, that's my take. PS, "Here is to Cardinal Puff for the first (Hic!!) time!!!!!!!!!" ,,,,anybody remember?????? To each his own I say. :-) Actually, it's not cold beer that bothers me as much as ice and water falling off the glass. Too cold, and I can't taste the flavor I'm probably paying extra for!